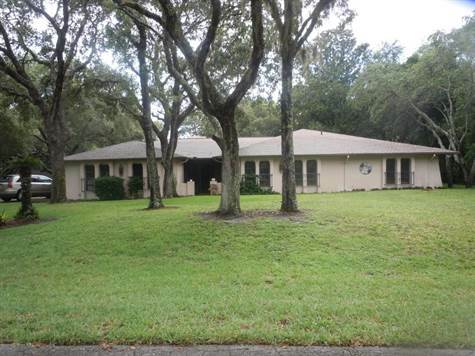 3 BED 3 BATH POOL HOME ON 1 ACRE LOT IN BEAUTIFUL ROLLING OAKS ESTATES. WOOD BURNING FIREPLACE IN LIVING ROOM, GALLEY KITCHEN & FAMILY ROOM/4TH BEDROOM AS MOTHER IN-LAW SUITE W/BATHROOM & ROLL IN SHOWER. 2 A/C UNITS, 1 NEW (2014), NEW ROOF (2015) & 2 HOT WATER TANKS, 1 NEW (2018). MASTER BEDROOM HAS WALK IN CLOSET & MASTER BATHROOM HAS BIDET & LARGE SHOWER. ATTACHED OVER SIZED 2 CAR GARAGE 22X22 W/NEW GARAGE DOOR OPENER (2018) & DETACHED 2 CAR GARAGE 24X22. ENCLOSED SUN ROOM/FLORIDA ROOM W/GLASS WINDOWS, LARGE INGROUND POOL RESURFACED (2017) W/SPA & NEW PUMP (2016). HURRICANE SHUTTERS, ROOM FOR RV OR BOAT & LARGE LANDSCAPED YARD W/SPRINKLERS. LIVED IN ONLY A FEW MONTHS OUT OF THE YEAR LAST 15 YEARS OR SO. MAKE THIS YOUR HOME CALL TODAY!